Coherent and non-coherent ultra violet (UV) light sources are used in a variety of situations. The safe use of coherent UV light is covered in the University of Toronto Laser Safety Program. The safe use of non-coherent artificial UV radiation sources in buildings under the authority of the University of Toronto will be covered by the Ultraviolet Radiation Safety Program. The University of Toronto is committed to ensuring that the use of UV radiation sources is carried out in a safe manner with due regard for employees, students, the public and the environment. The University of Toronto Radiation Protection Authority (UTRPA) is the executive body charged with ensuring that effective radiation safety programs exist for all sources of radiation. The Radiation Protection Service (RPS) is responsible for the development and administration of the radiation safety programs. The current UV radiation safety program does not cover exposure to solar UV light. Exposure to solar UV radiation is the predominant cause of skin cancer, particularly when the sun is highest in the sky, such as in summer during the middle of the day. Limiting UV light exposures at these times has the greatest potential for reducing skin cancer incidence. The best approach to implementing successful strategies in reducing skin cancer will be to encourage sun protection policies and practices that reduce sun exposure in both occupational and recreational activities. Solar UV radiation also affects the eyes by increasing the risk of photokeratitis, photo conjunctivitis and cataracts. Wearing sunglasses and a broad brimmed hat can prevent most of the UV light from reaching the eyes. For some of the sources described, the user may not be fully protected from UV light exposure by any inherent shielding around the source, or the user may not be aware of the hazards of UV light. The purpose of the UV Radiation Safety Program is to ensure that the safeguards necessary to limit exposure have been implemented. direction of the UV light – to ensure maximum efficiency, the surface that needs to be sterilized must have direct exposure to the UV light. Indirect exposure (scattered UV light) is less efficient in killing microorganisms. To verify the efficiency of the procedure follow the tests recommended in  or similar. The UV part of the electromagnetic radiation spectrum extends from 3.1 eV (400 nm) to 124 eV (10 nm). Most of the UV radiation is absorbed in air and does not pose a health risk. However the UV radiation in the range from 400 nm to 180 nm is less absorbed in air and can cause harm to the eyes and to the skin. This portion of the UV spectrum is separated into three parts: UVA from 400 nm to 315 nm, UVB from 315 nm to 280 nm, and UVC from 280 nm to 180 nm. Most of the UVC from the Sun is absorbed by the atmosphere. The UVC radiation produced by artificial sources can pose a health risk to a person situated in the vicinity. UVA penetrates the most in the eye and in the skin being absorbed in the lens and in the subcutaneous layer of the skin. Having less energy per photon than UVB and UVC radiation, UVA radiation cannot cause direct DNA damage but can create free radicals and oxidative stress which can cause indirect DNA damage. UVB and UVC are absorbed in the cornea and in the dermis and epidermis. These types of UV radiations carry a higher amount of energy per photon and can cause direct DNA damage. Large amounts of UVC can produce ozone above the limits. In humans, prolonged exposure to UV radiation may result in acute and chronic health effects on the skin, eyes, and immune system. An unfortunate property of UV radiation is that there are no immediate warning symptoms to indicate overexposure. Symptoms of overexposure including varying degrees of erythema (sunburn) or photokeratitis (flash burn = welder’s flash) typically appear hours after exposure has occurred. UV radiation can initiate a photochemical reaction called erythema within exposed skin. This “sunburn” can be quite severe and can occur as a result of only a few seconds exposure. Effects are exaggerated for skin photosensitized by agents such as coal tar products, certain foods (e.g., celery root), certain medications and photo allergens. The feeling of having something (like sand) in your eye. If you are concerned about your eyes for any reason. An overexposure to UV radiation can cause sunburn and some forms of skin cancer. However the most deadly form -malignant melanoma- is mostly caused by the indirect DNA damage. UVC rays carry the highest energy. They are absorbed at the surface of the skin, therefore are less likely to cause skin cancer. Chronic skin exposure to UV radiation has also been linked to premature skin aging, skin darkening, and wrinkles. Chronic eye exposure to UV radiation can create cataracts. When the possibility of producing ozone is high, the ozone concentrations can increase over the limits. Most people can naturally detect about 0.01 ppm of ozone in air where it has a very sharp, specific odor, somewhat resembling chlorine bleach. Exposures of 0.1 to 1 ppm produce headaches, burning eyes, and irritation to the respiratory passages. occurs with a 2-day lag phase after irradiation. The limit for occupational exposure to non-coherent artificial UV radiation incident upon the skin or eyes is 30 J/m2 (or 3 mJ/cm2) [1-5]. The exposure limit is based on a normal 24 hour cycle of light and dark where cellular repair takes place mainly when the exposure is discontinued. The exposure limit is intended to be used as a guideline only for Solar UV Radiation exposure. Permissible exposure time (measured in seconds) for exposure to UV radiation incident upon unprotected skin or eyes may be computed by dividing the 30 J/m2 (or 3 mJ/cm2) exposure limit by the effective irradiance measured in W/m2 (or mW/cm2). The maximum exposure duration may also be determined using Table 1 which provides representative exposure durations corresponding to effective irradiances in W/m2 (and mW/m2). The effective irradiance changes with distance. If the effective irradiance is known at a certain distance but not known at the position of exposure it can be calculated with information from Appendix A. If there are any doubts about the application of these limits please contact the University of Toronto’s Radiation Protection Service (RPS). All supervisors of work places where potential for exposure to artificial UV radiation exists must register the equipment with the University’s RPS. Since UV radiation can be easily blocked, the best control is to shield the UV radiation at the source . changes in work procedures, etc. When exposure is from artificial sources, engineering control measures are preferable to protective clothing, goggles, and procedural safety measures. Light-tight cabinets and enclosures (including dedicated rooms) enclosed with opaque materials or UV radiation absorbing glass and plastic shielding and fail-safe interlocks are the key engineering control measures used to prevent human exposure to UV radiation. For applications where cabinets are not practical, shields, curtains, barriers and a suitable separation distance are used to protect individuals against the UV radiation emitted by open sources. A high-power UV radiation source must have failsafe interlock access so that it is shut off when protective enclosure is open. Ventilation may be required to exhaust ozone and other airborne contaminants produced by UVC radiation. The work place supervisor is required to identify all potential UV radiation hazards associated with the workplace and equipment and then restrict all unauthorized workers and people from close proximity to the equipment or work area. The workers operating the equipment need adequate training to understand the hazards involved and to carry out their work safely. 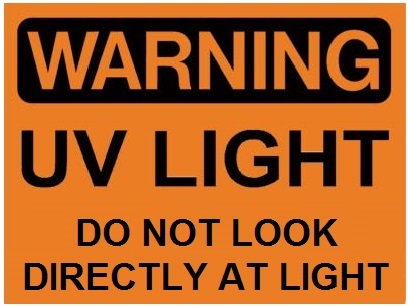 Warning signs, lights and labeling of potential equipment that emit UV radiation are additional measures that may be used to aid the protection of workers (see Appendix B). When enclosures with fail-safe interlocks, curtains or barriers cannot be installed, the distance from which workers operate the equipment has to be assessed as well as the duration of any exposure. When unprotected UV lights are used in a room access to the room must be restricted to person with training and wearing personal protective equipment (PPE). 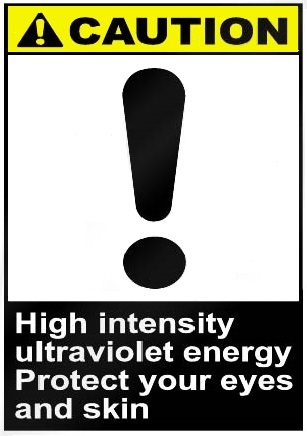 A warning light indicating that UV light is on must be clearly visible from outside the room. Employees with photosensitivity reactions to UV radiation require additional protective measures. UV radiation is easily absorbed by clothing, plastic or glass. In case of working with open UV radiation during maintenance, service or other situations, particularly if safety shielding is removed, all personal will be provided with personal protective equipment covering all areas of skin, eyes and face. The eye protection must protect you against both UVA and UVB (check the label to make sure that this is the case). Long sleeve lab coats, gloves, and face shields must be used to protect your skin. RPS does not routinely measure the intensity of UV radiation or determine the duration of an individual’s permitted use time. RPS will survey a source for light intensity upon request or if an accidental exposure is suspected and it is necessary to determine the potential extent of injury. Sources may also be surveyed at the discretion of RPS. Annual inspection of all existing areas where UV radiation is used and where the possibility of UV radiation exposure above the acceptable limit may be present will be performed by a Health and Safety Officer (HSO). In addition, all new equipment or devices that can produce high levels of UV radiation will be inspected by the HSO before the equipment or device is used. In performing a workplace inspection involving UV radiation, the check sheet in Appendix C will be used. For UV radiation over exposure of the eye, place a sterile dressing over the eye and get medical attention. For UV radiation over exposure of the skin, apply cold water or ice to the skin burns and get medical attention. Determine UV exposure levels and make sure that adequate controls are put in place. Intensity of UV radiation diminishes over distance. UV rays are predominantly emitted perpendicular to the surface of the lamp. In order to determine the intensity of UV radiation on a surface at different distances from a UV lamp, multiply the effective irradiance of the lamp rating at 1 meter (in μW/cm2) by the intensity factor opposite the distance selected as in Table 1. This table provides an approximate simplified method for quickly calculating UV radiation Eeff at different distances when Eeff at a certain distance is known and when air absorption is neglected. Good sources of information about your UV lamp will the manufacturer web page. Usually the effective irradiance of the UV lamps is given at 1 m.
What time may a person be irradiated by a lamp with effective irradiance at 1 m of 91.3 μW/cm2 without reaching the UV limit at a distance of 50 cm? Using information from Table 3 a correction factor of 4 is required to calculate the effective irradiance at 50 cm. At 1 m the exposure time increases to 33 seconds and at 2 m to 131 seconds. 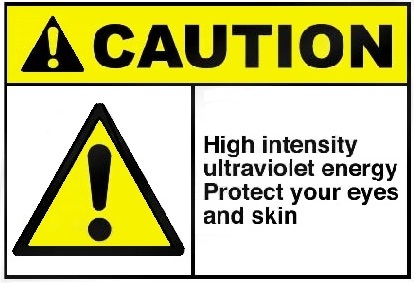 Danger: This device produces potentially harmful UV light. Do not expose eyes and skin to UV light.